We recommend going through a few steps prior to your event to make setting up at the venue as easy as possible. To see a list of items you should run through as a one-time step, see our article about preparing your iPad for public use. Leaving Simple Booth running at an event uses a lot of power because the camera and camera preview require a lot of resources. Be sure to close other apps, charge the iPad, and bring an Apple manufactured charging cord with you to keep the iPad powered throughout the event. Many venues do not have a reliable internet connection. While our apps will work offline, you will need the internet to log into the app and create a Gallery. If possible, it's best to bring your own wireless hotspot so that you don't run into any surprises with connectivity issues. Read more about our offline upload queue and how to get queued items to upload. Note: if you have the opportunity to try multiple WiFi networks while setting up for the event, be sure to “forget” all other networks except the one that you plan to use. We recommend having at least 5GB available storage on your device before any event. 5GB is plenty of space for a busy event and some wiggle room for our offline upload queue in case WiFi is unavailable or unreliable. Access iPad storage settings by opening the iPad's settings app and visiting General > [Device] Storage. When viewing these settings, iOS might offer recommendations for optimizing your device's storage. 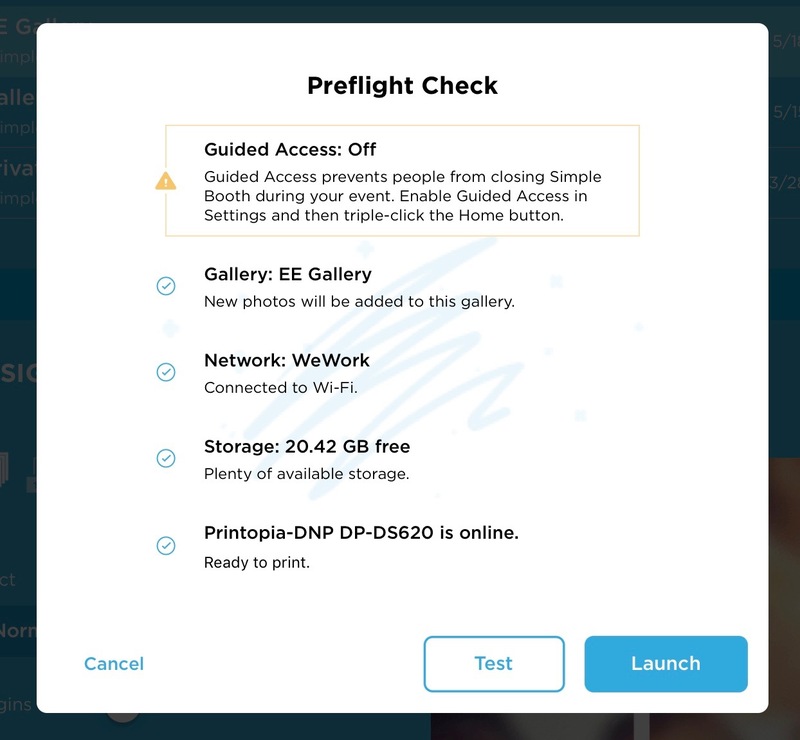 Guided Access is a feature built into your iPad that prevents guests from leaving the Simple Booth app during your event. First, enable Guided Access in your iPad settings. After enabling the feature, triple click the home or side button, select guided access (if asked), tap "start", and enter your password in order to start a Guided Access session. When your event is over, triple click the home button to start the process to end the guided access session. Once you have everything else set up (including lighting and the positioning of the booth) it's a great idea to take a few test shots. You can tell from the test photos if you need to move your backdrop to better fit in the frame, change the exposure, or make other adjustments. When you take test pictures in Test Mode, you'll be prompted to save or delete these from your Gallery when you launch into Booth Mode, and can easily return to your settings to make any last minute changes. Your app includes a Preflight Check similar to this list! Taking a quick scan of this list when launching the booth can help you avoid potential problems related to each of the items. A yellow warning icon will appear next to anything you should take a second look at.